Best Plumbing Tip In Phoenix - Paper Towel | Robins Plumbing, Inc. Recently Robins Plumbing was featured on the radio with the Real Estate Guy, Chris Dunham sharing our expertise and plumbing tips for the “Home Physical Show”. We had a lot of fun on that show and want to share some of our best plumbing tips for your home. The majority of floods we’ve seen here in the Phoenix area are preventable, with a little due diligence on your part and following some very simple advice you can save your family a lot of headache. In our experience as Phoenix Plumber, one of the leading causes of leaks in Phoenix is actually washing machine hoses. We never think about our washing machine hoses or valves because we rarely ever use them. The same goes for our angle stops under our kitchen sink, bathroom sinks and behind our toilets. These valves are there to be able to eliminate emergencies and isolate the fixture during repair. Often these valves and supply hoses will start with a very small drip, but over time, without notice they turn into a massive flood. I’ve seen many homes flooded with thousands and thousands of gallons of water from a burst supply line or broken angle stop. The panic I hear in a homeowners voice when they get home from a long day at work to find their home destroyed and under water is always heartbreaking. Here is an example of a client’s water heater that demonstrates the importance of checking your plumbing systems. This leak could have been avoided, unfortunately the homeowner didn’t notice a drip at the valve for everal months. 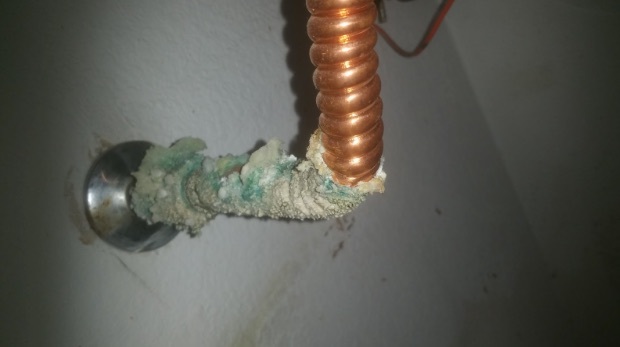 This drip eventually rotted out his wall and destroyed his water heater. It wasn’t covered by their insurance because it was considered neglect because the leak had been going on for such a long time. This ended up costing the homeowner several thousand dollars in repairs to put their home back in order. My favorite tip to offer homeowners, is to use paper towel. 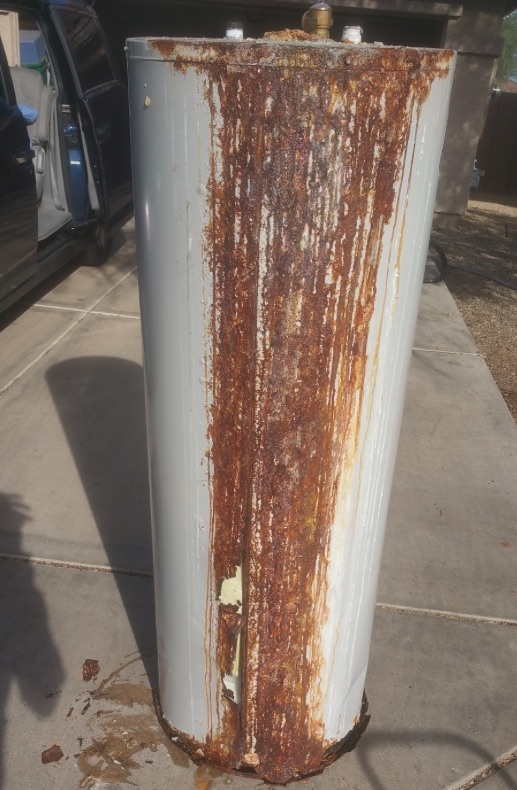 I encourage our clients here in Phoenix to inspect their plumbing every quarter. This isn’t going to require any plumbing experience or expertise. What you need is a couple of minutes, a reminder on your calendar and a few pieces of dry paper towel. Washing machine – 2 shut off valves and supply hoses (hot and cold) if your supply hoses are black rubber we recommend replacing them with stainless steel braided supply lines. Water heater – 1 shut off valve. If this valve has a round handle it is a gate valve, we recommend replacing this with a ball valve. At each valve you will want to turn them off and then back on. Make sure that each valve is in good working order, then take a dry paper towel to each valve and supply line and wipe them off. Make sure the paper towel is completely dry. If the paper towel is damp at all it is time to get the valve and/or supply line replaced immediately. Perform this same procedure at the washing machine and the water heater. Did you know that if you’re a Loyalty Member of Robins Plumbing we will come out and provide a plumbing inspection once a year just for being a member?